Shown above: 2 Lodge Club Chairs, 1 Lodge Loveseat, and 1 Lodge Ottoman. Set your sights on East Coast glamour with the enviable Lodge Collection, now available from Teak Warehouse. A remarkable addition to your home or garden, the Lodge Collection builds a bridge between rustic charm and sophisticated style with its incredible combination of Distressed Teak in a beautifully designed collection that will make you the envy of your friends! With plush Sunbrella® cushions in tow, you’ll be thrilled with the amazing results. Featuring in this amazing collection is the comfortable and cushy Lodge Loveseat, luxurious Lodge Club Chair, Lodge Ottoman for lounging and the Lodge Coffee Table. All pieces look amazing alongside one another or as an individual statement item. Distressed Teak is strong, durable and gorgeous to look at! Teak is the best choice of wood for outdoor furniture, it has natural rubber and oil so even when it is distressed or weathered, it will remain hardy in an outdoor environment. Sunbrella® is world renowned for having the outdoor material that is UV treated, so you can be rest assured that your incredible Lodge Collection will stand the test of time. 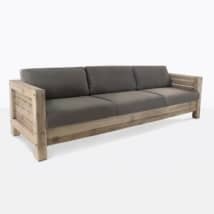 Teak Warehouse is recognized nationwide and further afield as the leaders in outdoor furniture, enjoy the range of deep seating, dining, loungers, relaxing chairs, pots and planters and accessories for your outdoors. Choose from the amazing materials we offer such as A-Grade Teak, Raw Concrete, Batyline® and Textaline® mesh fabrics, Aluminum, Stainless Steel and All Weather Wicker. 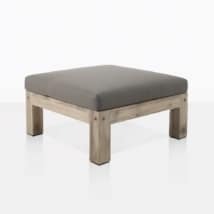 We supply designers, film studios, restaurants and individuals all over this great nation and we are proud to be leaders in customer service as well as the number one choice in outdoor furniture. We are thrilled to introduce the Lodge Collection to our amazing array of styles at Teak Warehouse. Place an amazing Lodge Loveseat on your patio, flanked by two Lodge Club Chairs, situate one Lodge Ottoman to the side and a Lodge Coffee Table for good measure, and enjoy the instant transportation to tranquility that you deserve. Lodge is a tremendous choice for the home or office as well. Imagine your polished concrete floors with this hearty suite a central focus in your living room. Make the corporate environment a cool one with several of the Lodge Club Chairs in your lobby or meeting room, complete with a matching Lodge Coffee Table or a Raw Concrete one to harness a more contemporary vibe. 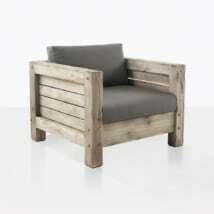 The Lodge Distressed Teak Collection of Deep Seating will bring you comfort and style. Call or email us to get started on your order.